Flyers from one of the most powerful neo-nazi groups in America are appearing all over the Cincinnati and Northern Kentucky warning of possible race riots if George Zimmerman is found NOT GUILTY in the Trayvon Martin case and that “white people” should prepare for possible “possible black riots” and to defend themselves accordingly..
AN INCIDENT OF SELF DEFENSE IN FLORIDA HAS BECOME THE NATIONAL MEDIA’S LATEST WHITE GUILT EXERCISE. THE ZIMMERMAN/MARTIN TRIAL IS OCCURRING BECAUSE THE MEDIA MASTERS WANT TO MAKE AN EXAMPLE OUT OF THE SHOOTER, THAT TO DEFEND YOURSELF, YOUR FAMILY, AND YOUR NEIGHBORHOOD FROM THE BLACK CRIMINAL ELEMENT IS UNACCEPTABLE AND WARRANTS PROSECUTION. THE FACT THAT THE MAN ON TRIAL IS HIMSELF NOT EVEN WHITE HAS NOT STOPPED THE MEDIA FROM PUBLISHING THE TYPICAL NONSENSE, YOU KNOW, “RACIST WHITE IS STILL PERSECUTING THOSE INNOCENT AND HARMLESS BLACKS”. THE TRIAL HAS NOT WENT WELL FOR THE ANTI-WHITES AND IT LOOKS LIKE THE EVIDENCE IS ON THE OTHER SIDE OF THE HISPANIC SHOOTER. HOWEVER, WITH THE MEDIA PAINTING THE PICTURE THAT ANOTHER “WICKED” INJUSTICE HAS OCCURRED WITH REGARD TO THIS SHOOTING THE EVIDENCE WILL NOT MEAN ANYTHING TO MANY BLACKS AND IF THE JURY DECIDES ON A “NOT GUILTY” VERDICT THERE MAY BE TROUBLE SINCE THE MEDIA WILL NO DOUBT BE CRITICAL OF THIS AND WILL NO DOUBT BE SHRIEKING ABOUT “RACISM” REARING ITS UGLY HEAD – MANY BLACKS WILL HAVE A READY MADE EXCUSE TO START TROUBLE. IT IS FOR THIS REASON THAT WE ISSUE A WARNING TO ALL WHITES TO TAKE PRECAUTIONS AND REMAIN AWARE THAT BLACK RIOTS ARE POSSIBLE AFTER THE TRIAL CONCLUDES. IF YOU OR YOUR FRIENDS OR RELATIVES LIVE IN AN AREA WITH A LARGE NUMBER OF BLACKS YOU SHOULD CONSIDER MEASURES NOW THAT WILL HELP PROTECT YOURSELF AND YOUR PROPERTY. YOU MAY NOT LIVE IN A BLACK AREA BUT YOU SHOULD BE CAUTIOUS AND WARN LOVED ONES TO BE CAUTIOUS IF THEY WORK IN A MALL OR SUPERMARKET, ANY BUSINESS THAT MAY BE A TARGET FOR LOOTING DURING A RIOT. WE ALSO WANT TO AVOID SEEING THE SHAMEFUL SCENES THAT OCCURRED DURING THE RIOTS IN CINCINNATI (THEY HAVE DONE IT ONCE, THEY CAN DO IT AGAIN FOLKS) OVER A DECADE AGO. PEOPLE ARE ADVISED TO HAVE SOME SENSE OF SELF PRESERVATION CERTAINLY, THE MEDIA MAY CONSIDER THE IDEA RACIST, BUT IF YOUR VEHICLE IS BEING BEATEN AND BANGED ON, ITS PATH BLOCKED BY VIOLENT BLACKS THEN ONE HAS THE RIGHT TO DEFEND THEIR LIFE. DON’T BE LIKE THE ONES THAT HAVE BEEN DRAGGED FROM THEIR CARS IN THE PAST AND BEATEN. DON’T FORGET WHAT THE GAS PEDAL IS USED FOR, IT MIGHT SAVE YOUR LIFE. 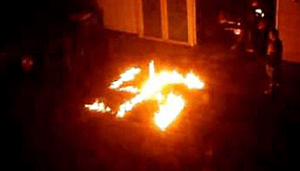 The Southern Poverty Law Center (SPLC) and the Federal Bureau of Investigation called the Alliance the best-financed and best-organized white nationalist organization of its kind in the United States. The National Alliance was founded by university physics professor Dr. William Luther Pierce in 1974 and the author of the white supremacists version of Mein Kamph The Turner Diaries and Hunter, both novels about a white revolution in America, under the pen name Andrew MacDonald. 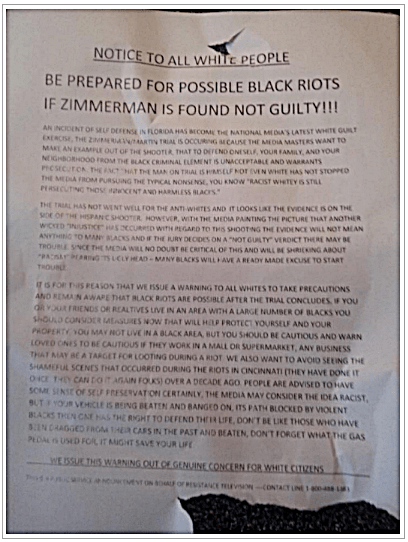 The flyer pictured below was posted on a telephone pole one block away from where I live. I doubt there would be any riots, but if there are…what else is new ? Gays just have to watch their backs because of black homophobia, but that’s ALL the time, not just during a riot. and this is a lgbt issue because……? most lgbt’s are white and you’re helping the community to be aware?